Wow! I have just uncovered one of my new favorite vegetarian Weight Watchers recipes ever — these incredible Stuffed Pepper Enchiladas!! Full of all the Mexican flavors you’d hope for, and then some, this healthy dish combines the idea of two traditional recipes – stuffed peppers and Mexican enchiladas. By using quinoa, black beans and veggies as the filling for the stuffed peppers instead of the traditional beef and rice, I was able to cut down on a lot of calories, fat and carbs. And adding lots of Mexican flavors to the quinoa filling, and then topping the dish with a red enchilada sauce and blend of cheeses, this fantastic dish brings together two very tasty worlds for just 5 Points per serving. 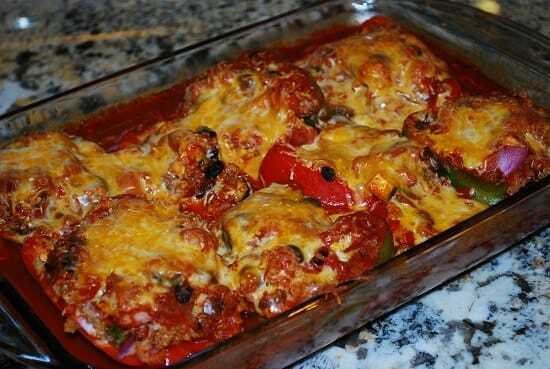 Filling, flavorful, and sure to satisfy your taste buds, this Stuffed Pepper Enchiladas Recipe is a must try. It’s so easy, and is a great healthy family dinner idea. Enjoy! By far, one of the best Weight Watchers Vegetarian Recipes I’ve ever made. So easy, so delicious, you’ll feel great about this healthy alternative to traditional enchiladas. And at just 5 Points per serving, you’ll feel very satisfied for such few Points. Cut bell peppers in half, remove seeds, and microwave them for about 2-3 minutes in a microwave safe bowl or dish with about ½” water in the bowl. This will help soften the peppers. Meanwhile, prepare quinoa according to package directions. In a large bowl, combine cooked quinoa, zucchini, beans, cilantro, onion, lime juice, garlic, cumin, smoked paprika and salt & pepper together. Place peppers in a large baking dish, cut side up, and fill each pepper evenly with the quinoa mixture. Pour can of enchilada sauce over all the peppers and then top evenly with the shredded cheese. Cover with aluminum foil, but make sure the foil is not touching the cheese. Bake in oven for about 30 minutes. This is one of my all-time fav recipes. I’ve made it so many times. It’s so yummy! I found a southwest quinoa in the frozen foods that I’ll use in place of it tonight. I also add browned hamburger or ground sausage. Delicious! Might I suggest you change the title of your recipe to not include “enchilada” since there is no corn tortilla in the recipe? Or maybe make it Stuffed Peppers in Enchilada Sauce? Yes, it’s 1/2 cup uncooked quinoa. One more thing how many smarttpoints is it? This was definitely good and healthy, but it was way too much sauce for me. Next time I would use only half the amount of sauce. Also, it came out to 8 point plus per serving for me–not sure where you got 5 from? Thanks for sharing! Made this recipe EXACTLY as written ~ MINUS the salt. and did not notice that there was no meat in it. This was an insane amount of enchilada sauce and completely ruined it. It overpowered all the other flavors, I might as well have just poured the can of enchilada sauce in a bowl and ate it like soup. I feel like 1 tsp of salt is way too much. The resulting mixture is so salty, even before being combined with the enchilada sauce. If I made this again I would salt to taste only. This is over the threshold and really brought down the whole thing :-(. Bummer. Hi! I was wondering what the point difference would be if I used rice instead of quinoa? This recipe rocks! The flavors are amazing together. I have made it twice and the second time only used the red bell peppers, my preference. It makes such an attractive dish either way. I love that two halves is one serving! Yummy! Peppers were a little underdone for me, I like cooked peppers but not raw ones. Other than that it was delicious! Made this for dinner tonight. Review? Delicious, although super spicy! I used Chi Chi’s enchilada sauce. Maybe it’s just me. Don’t eat spicy that much anymore. Also, I’m amazed that two of them is one serving. I could only eat one, and I have a great appetite. Maybe I used more zucchini than recipe calls for. When it says small zucchini, not sure what that meant. Overall, A+!!! When I calculate this, it comes out to 6 points+ for the beans, quinoa, enchilada sauce and cheese. Is there some secret to making it that brings it to only 5 points+? Great question!! It may just depend on the brands of ingredients you use. This is exactly why I NEVER rely on the Weight Watchers Recipe Builder. Depending on the nutritional stats of your ingredients, your recipe may come out to 6 Points +. How is there that much cheese and still 5 points? Love it!